Absorbing chronicle of a prominent 17th-century English family. With characteristic aplomb, British architectural historian Tinniswood (By Permission of Heaven, 2004, etc.) adjusts his gaze to focus on the aristocratic Verneys, who had a particularly fascinating—and occasionally sordid—history. Drawing upon a treasure trove of more than 30,000 letters, the “largest and most continuous private collection of seventeenth-century correspondence in Britain,” the author chronicles the lives of “apparently ordinary” members of the Buckinghamshire gentry who were, in fact, anything but ordinary. In unfalteringly lively prose, Tinniswood sorts out the complicated family history, weaving into a rich tapestry everyone from miscreant Sir Francis, a pirate and mercenary who met an untimely end far from home after renouncing his wealth and country, to staid patriarch Sir Ralph and his extended clan. Given subjects who enacted more real-life melodramas than a Restoration tragedy, the author is even afforded an opportunity to muse upon the complicated 17th-century history of mental illness. Tinniswood chronicles with great feeling young Mary Verney’s descent into psychotic fits, as well as many other sad episodes documented in detail by frank family letters. These enable him to present an invaluable case study of aristocratic Stuart England’s manners, customs and affairs—financial, legal and amorous. 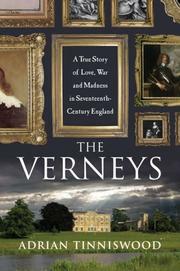 The author’s admiration for the Verneys is evident on every page, as is his thorough research. Tinniswood’s previous histories were occasionally didactic; this tome proves that, given the right material, he possesses a novelist’s talent for storytelling.